Olympique Lyonnais coach Hubert Fournier has advised striker Alexandre Lacazette to remain at the club next season in light of Premier League interest. The hotshot forward and France international has received considerable interest from England over the last few weeks and months, with the likes of Manchester United and Liverpool believed to be interested in his signature. The French press have also indicated that Paris Saint-Germain are looking to nab the striker from their title rivals. Chelsea and Arsenal have also been linked to the 23-year-old, who has represented France at every youth level from the U16s to the senior side, for whom he made his debut in 2013. While OL look likely to miss out on the Ligue 1 title—they sit six points behind Paris Saint-Germain with two games to play—Lacazette is coming to the end of a wonderful individual campaign. The forward has scored 27 times in 32 matches for Les Gones and has been in exceptional form. 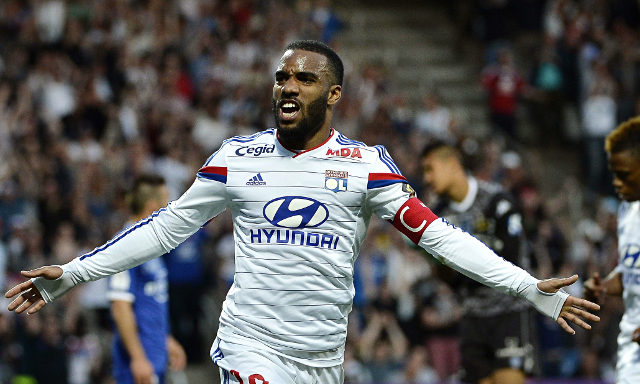 However, Lyon coach Fournier has outlined his belief that the player will stay at the club. “I don’t believe [Lacazette will leave] because the president was rather clear on the subject,” began Fournier, speaking on Le Club show on beIN Sports [via Le 10 Sport]. “I don’t believe so because it would not be in the interests of Alexandre to take a decision which could ultimately put him in trouble only one year ahead of the European Championships.